Just like in the district semifinals, Republic allowed an early goal on a corner kick in the district championship game Thursday night. Unlike the district semifinals, the Lady Tigers weren’t able to recover. 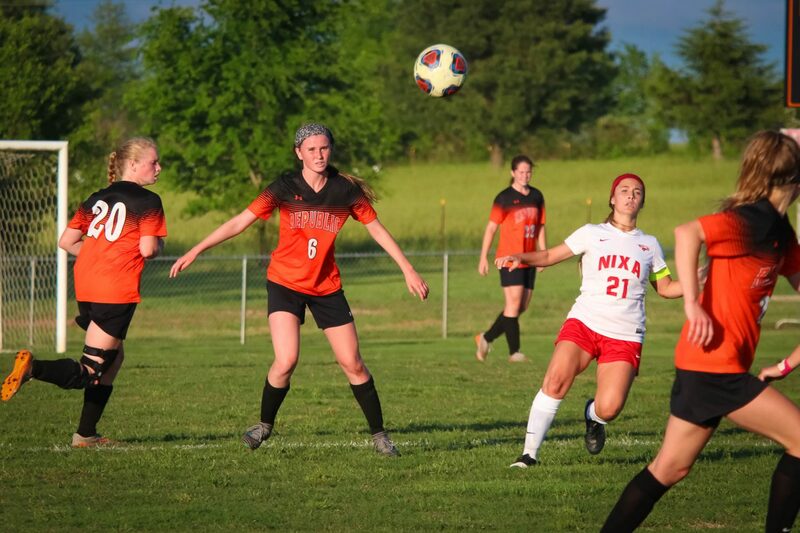 Nixa rode the momentum of that first goal to a 3-0 shutout win at Republic Thursday, capturing a district championship and ending the Lady Tigers’ season. Republic coach Kevin Hauck says the early goal by Nixa played a big role in the outcome of the game. Republic’s best scoring opportunity of the first half came a few minutes later when Emma Pearce briefly had a 1-on-1 with Nixa keeper Riley McClintock, but McClintock charged at Pearce to force a quick shot, and the ball rolled wide left. In Tuesday’s semifinal, Republic had overcome a 1-0 halftime deficit to beat Branson, but Nixa made sure that didn’t happen by continuing to control possession with a patient attack in the second half. The Lady Eagles went on top 2-0 in the 50th minute, then scored again to put the game away in the 61st minute. Republic ends its season 14-7. The Lady Tigers allowed just 22 goals all season, shattering the old school record of 30 goals allowed in a season. Goalkeeper Tara Campbell and the defense ended the year with 11 shutouts. Despite the disappointing ending to 2018, Hauck says he saw positive signs for the program throughout the year.